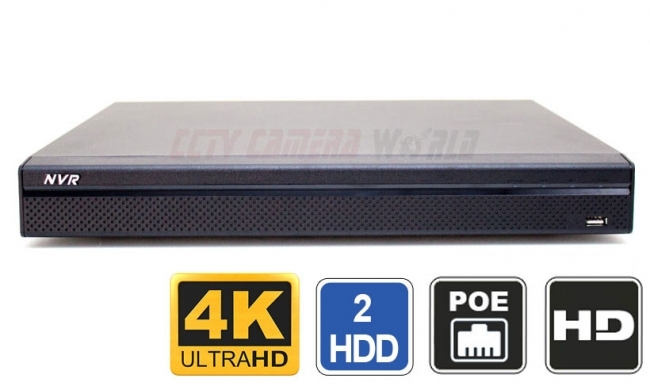 This H.265 and H.264 NVR is our newest professional 16 Channel 4K NVR with 12MP IP camera recording support. This unit packs a strong processor with a 320Mbps recording bit rate capability. If you are looking for the most powerful 16 Camera NVR in a small form factor, then you've found it. It has 16 PoE+ ports (Power over Ethernet) that make it simple to connect IP cameras and setup your own IP camera system. Using a single network CAT5e/CAT6 cable you can not only power our IP cameras, but also receive video, audio, and data. You can choose from a variety of PoE cameras we offer, ranging from 1080P IP security cameras, 4MP security cameras, to 4K and 12MP cameras. Inside this 4K H.265 NVR there are 2 SATA ports that accept up to two hard drives. Each drive can be up to 8TB in capacity. This NVR is small in size and easy to stow away in a storage or IT closet, however it is not rack-mountable. This NVR recorder has a powerful quad-core processor and a embedded Linux operating system that stays virus free. The user interface is easy to use using the included mouse, making it simple to connect your cameras, set recording schedules, and motion detection schedules. 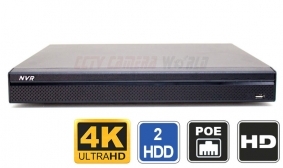 This 16 camera PoE NVR also offers 2 video outputs (HDMI, and VGA) so you can connect up to 2 monitors directly to the NVR displaying the same screen. Let's not forget there is also two way audio support, and 4 alarm inputs should you choose to add PIR motion sensors for precise and accurate motion detection. Video backups are easy to do. They can be done locally at the NVR using a USB drive, eSATA drive, or external USB DVD burner. You can even download video from the unit over the network or internet using the included free Client software for Windows and Mac computers. Our client software is easy to use and is the preferred method for viewing, playback, and download of video on a daily basis. You can view up to 64 channels per screen on your computer and use the tabbed window feature to open up multiple tabs of view to cameras from one or different NVR/DVR. Be sure to watch our demo videos about the best internet security cameras for more information about remote viewing capabilities. This unit comes with FREE Lifetime Technical Support by our expert staff. 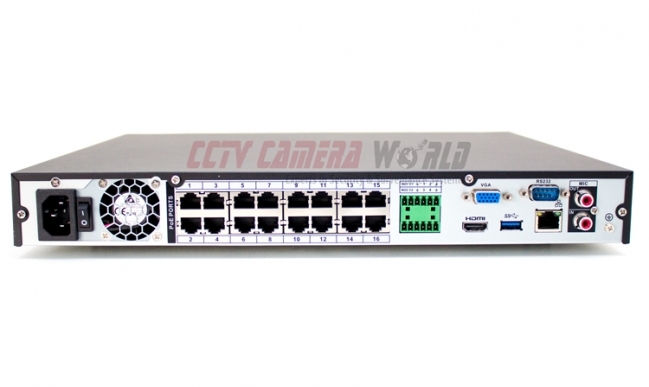 All the cameras we sell at CCTV Camera World are compatible with our NVR recorders, and Tribrid DVR. If you are looking for compatibility with cameras purchased elsewhere, please be sure to review our IP camera compatibility list. Dimension (W×D×H) 14.8" x 12.9" x 2.1"
I see that this NVR has 16 RJ45 ports for the cameras. Can cameras connected to the LAN be linked to this NVR or do they have to be directly plugged into the NVR? Yes of course you can add cameras from your LAN to the NVR. The NVR can search for compatible cameras on your LAN or the PoE ports on it. Just make sure you are using a proper PoE switch to power the cameras. Hello. This question is about the 16 channel NVR and setup of the cameras. We do not have internet access at our location, so the system is being installed as a standalone. When we install the cameras and set up the field of view, camera position, lens position, etc, is there a way to view the camera images on an iPhone or iPad? You can only view a NVR from an iPad or iPhone if you have the NVR on a network, i.e. connected to a wifi router. If you don't have internet, you cannot view the system offsite from the internet. But if you have a local network managed by a router, then you can connect the NVR to the router, and connect your iPhone/iPad to the router's wifi, and pull up the DVR using the local IP address assigned by your router to the DVR or NVR. This would only be for viewing onsite. Am I in the correct thinking that this unit can be used as a stand alone without internet access? It will take care of the addressing of the cameras and such and the only need for internet/network access would be to remote view the images? That is correct. This and other NVRs we sell are standalone NVRs that can function without internet. You would only need an internet connection for remote viewing. Our insurance requires us to record 24/7/365 and that should require about 30TB of storage, am I able to plug a NAS or External Hard Drive into the USB Port on this and have it record to it? 1) You have cameras that are compatible with our NVRs. You can always contact us with the make and model of the cameras you have. Please note we can only guarantee compatibility with security cameras purchased from CCTV Camera World. To learn more about the risks of using third party ONVIF securiuty cameras click here. 2) You calculate the correct storage amount using our security camera storage calculator which can be found our security camera page. In regards to the NVR516P4K what FPS do you get on each of the 16 channels when you record with 16 4k (8mp) cameras. You can use any of our 4K security cameras that support H.265 with our NVRs. You can get full 30fps per camera at 4K as long as you are within the bit rate maximum of the NVR.